I have survived another X-mas. It’s usually my favorite holiday; I love the lights and decorations, I love the music, and of course, I love the food. This year it has been a drab and not so merry Christmas for various reasons. The National Christmas Tree was small and not very bigly. There were no decorations or lights on the major thoroughfares. The whole atmosphere was less than festive, thus I turned to food to try to pick up my spirits. This year at the ‘rentals on Christmas eve we did Honey Baked Ham and Turkey with the usual sides. As always, the ham did not let me down, and yes, Bo and I tried to eat all the crispy honey coating. Christmas meal part deux was a fall-apart brisket and 2 racks of Aussie lamb chops cooked to perfection, both rubbed with Jovian Pantry® V Spice Seasoning. It was the first Christmas in the U.S. for the Iranian wife of one of my close friends, so I wanted to make it a special one for her. Seeing her eyes light up with all the Christmas food and presents made my bells jingle a little jangle, finally. As always, there were plenty of leftovers and packed food to go. 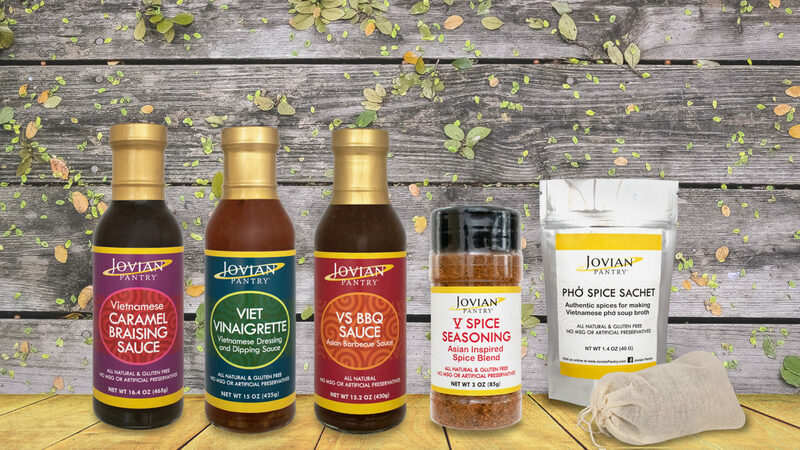 This year we saw Jovian Pantry® expand its reach, output, and product line. Not to say that there were not some issues and headaches, but as a new company, we have been very lucky. The hits this year were not only our Caramel Braising Sauce but also our Phở Spice Sachet and later our V Spice Seasoning. I am very happy that our V Spice Seasoning has been received so well; everyone loves both its flavor and versatility. I may be slightly biased, but I have yet to put it on or in something that didn’t turn out fantastic. In the new year, we will be coming out with some more different but delicious sauces and seasonings. The expansion of our product line, as well as our distribution, will be our top-most priorities in 2018. In order to succeed in any endeavor, lots of effort and perseverance is necessary for success. The quality and consistency of our products are also of utmost importance. Our customers’ enjoyment of our product and trust in our brand is very important to us. May 2018 be a prosperous and happy year for everyone! If perchance you are looking for a delicious yet easy meat entrée for your New Years Eve meal or party, please try our V Spice Seasoning on any protein you may be serving. It will definitely ring in the New Year by being easy, authentic and delicious. Cut 4 to 5 pieces of Heavy Duty aluminum foil to fully cover and tightly seal the brisket. If you don’t have a meat rack, then also cut 4 short pieces of aluminum foil and scrunch them into long rolls. Wash the brisket in cold water and run the meat needler on both sides of brisket. Apply the V Spice Seasoning – 2 to 3 tbsp per side, and rub into the meat, making sure to cover all surface area including side edges. Stack the long aluminum pieces and place meat rack or scrunched rolls onto them. Set brisket fat side up on top of rack or rolls and begin to make airtight packets with stacked aluminum pieces. The key is to hermetically seal the brisket, cooking it in its own juices. 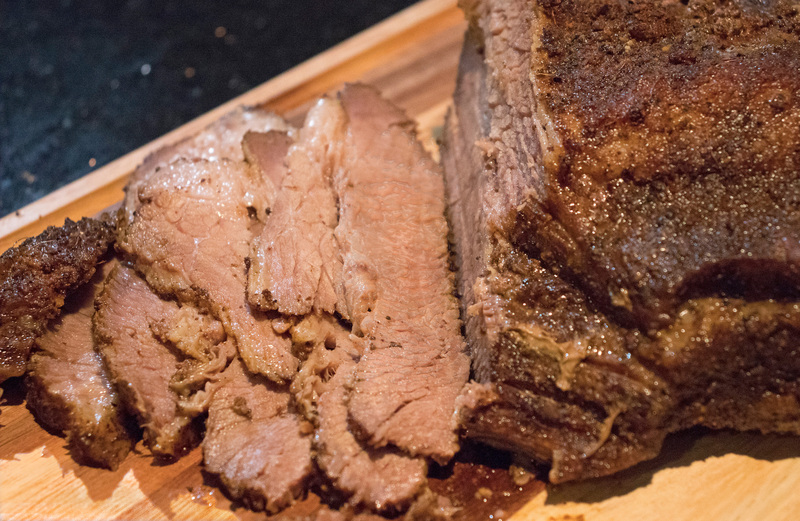 Cook the brisket for 40 minutes for every pound, so a 6-pound brisket will need to be cooked for 4 hours. Now go do whatever you want and when 4 hours are up, it is time to unseal the treasure. Take out the brisket and CAREFULLY peel back all the layers of the foil exposing the fat. Turn the oven to broil and place the brisket back in the oven for about 2 minutes to blacken and sear the fat. Do not walk away from the oven and monitor this process because it will sear very quickly. Remove from the oven and let it rest for about 15 minutes and then enjoy the juiciest, most tender brisket ever!